So last week I had the great fortune to not only present an Artificial Intelligence paper at Stanford on behalf of my Summer Internship Employer but also to attend a little of the Game Developer’s Conference in San Francisco. The conference I was presenting it at was the AAAI Symposium and had lots of interesting people. Including a professor working on a story system called Twig which allows you to direct the characters and create scenes using structured english. It was quite neat – especially when he setup his Monty Python sketch. The paper I presented was about using evolutionary fuzzy cognitive maps in creating believable characters for telling stories in virtual worlds. It took the idea of fuzzy cognitive maps, where a collection of entities or concepts have relationships that impact each other, and added the random probabilities of Bayesian Networks. The author of the paper is in Singapore and was not able to get a visa in time for the conference, so with one week to go they quickly gave me a call and I happily agreed to help them out. The day after I headed north from Stanford to San Francisco and roomed with other friends who were attending GDC. I only had Tuesday available but I made the most of it by attending the Canadian-Dutch Breakfast, taking a tour of Three Rings Studio, and attending some evening networking events. The Dutch Breakfast was excellent I met some exciting entrepreneurs. This was very valuable for me as I am looking to work in the Netherlands for a change of pace. I really would like to see what working in Europe would be like and the Netherlands is my preferred place in Europe to be. Combustic is being founded by a passionate developer looking to bring more digital media to the real world. I really liked the ideas he brought forward and am wanting to learn more. ranj designs serious games. Getting to talk with one of the heads of the company in a booth was amazing. GAF showed me their game for aiding Dutch People to get used to speaking English and using it in public places. He also showed me their award winning Shark-world: an innovative game that gets players used to working as a project manager and dealing with the day to day troubles that a project manager has to work with. It even has some Alternate Reality Game elements when you get texted by the game on your cellphone! These are games I would love to work on. Later when I went to Three Rings I must admit that I was so excited to be exploring a company’s headquarters that looked like a pirate ship! It was very cool! I’m a big fan of Puzzle Pirates and have played it for many years. Their Whirled version of their office is cool, but doesn’t do the full justice of how mind-blowingly great the office really is! (They have a secret room!) And to be able to listen to Daniel James, the CEO and designer of Puzzle Pirates, tell about the history of Three Rings was awe-inspiring. Star collection Progress Text and loss animations added after one week-cycle. 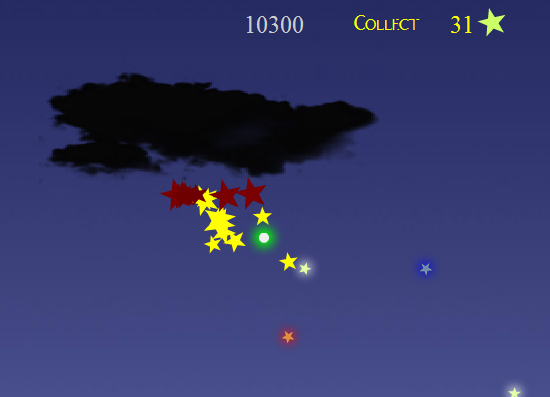 Goal: Collect the stars and guide them safely to the lamps (white objects on the bottom of the level). Avoid the Black clouds which will destroy your stars. Finally, You get more points if you’re carrying more stars when you light the lamps.